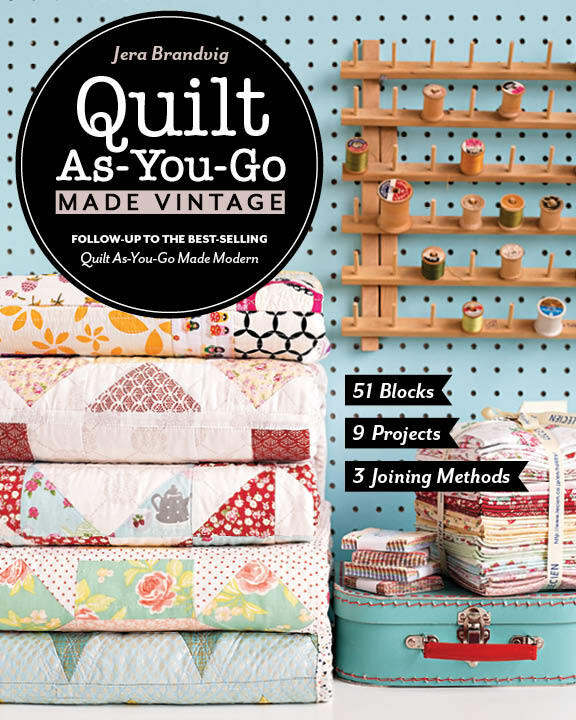 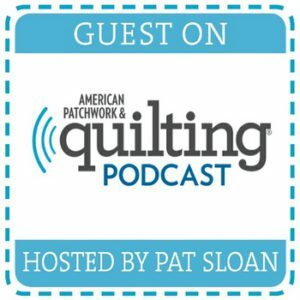 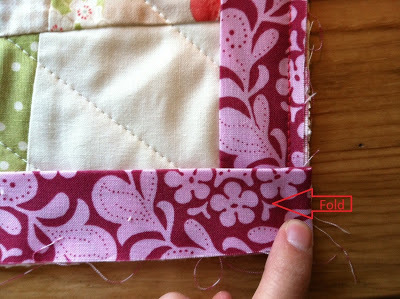 When I started quilting, I had no idea how to do this. 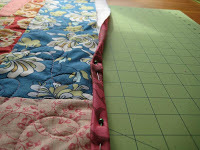 My knots would look so ghetto, lol. 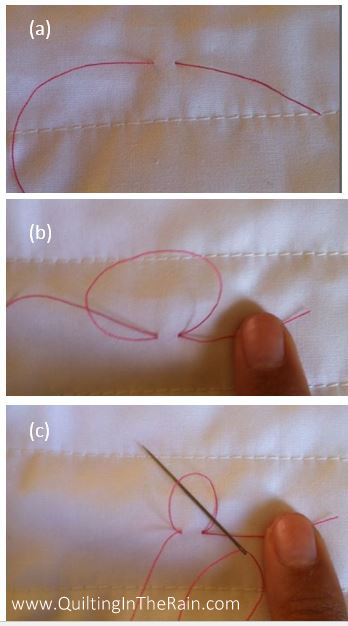 This may be a no-brainer to a lot of you seasoned sewers out there, but for all of you that’d like a quick lesson, here’s a 3-step tutorial. 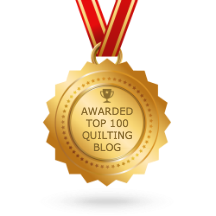 I know I would have appreciated this 6 years ago! 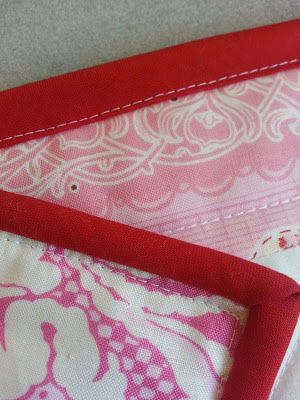 (Sorry the picture quality isn’t the best – I was taking these photos with my left hand). 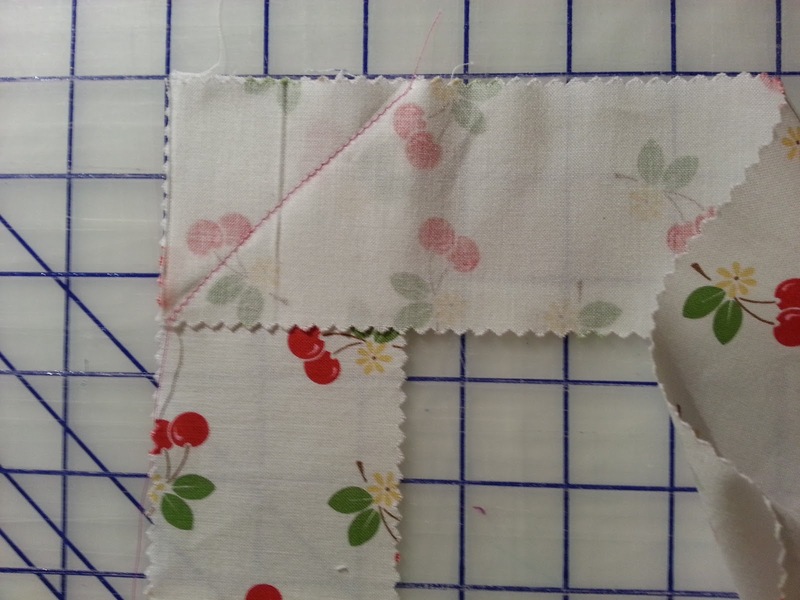 You basically just a) and b) With your needle and thread, make a loop. 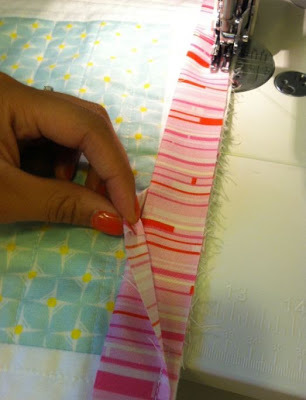 Hold the thread’s tail so it doesn’t slip out. 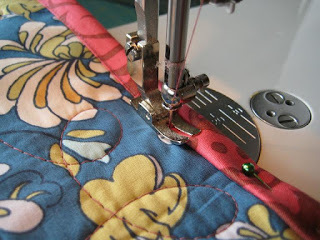 Then c) put the needle through the loop to create a knot. 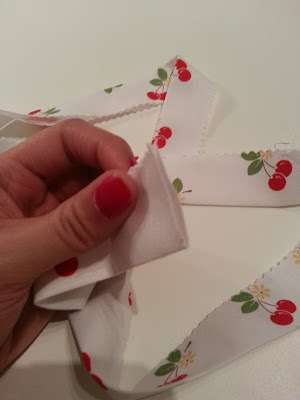 You can repeat a couple times. 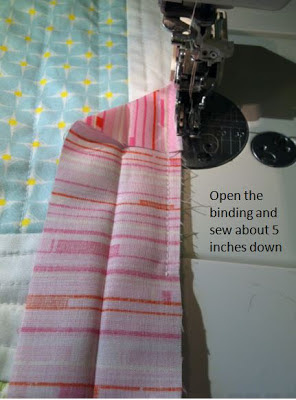 This is great for when you’re hand stitching your binding. 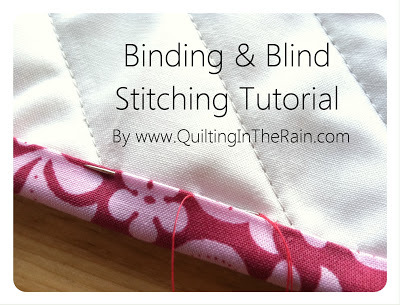 I also have a short video I made a while back on my Binding & Blind Stitching tutorial (scroll down for the video). 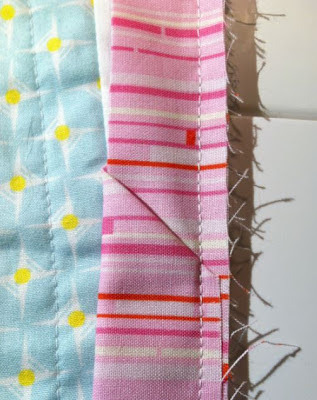 There’s another technique on how to tie off a blind stitch. 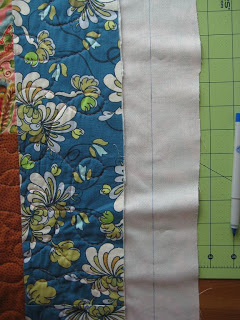 Either way works. 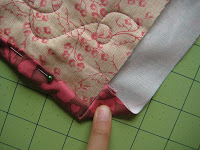 That’s it for now – just a quick tip! 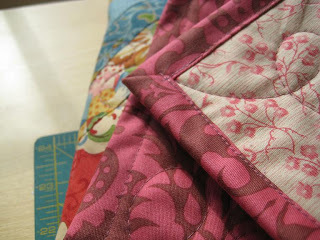 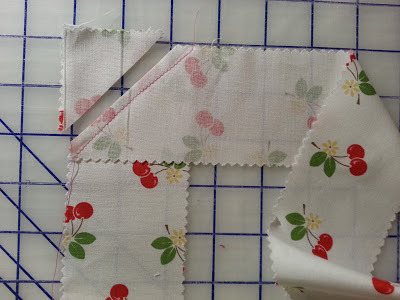 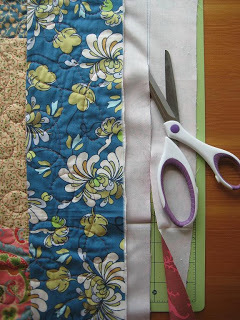 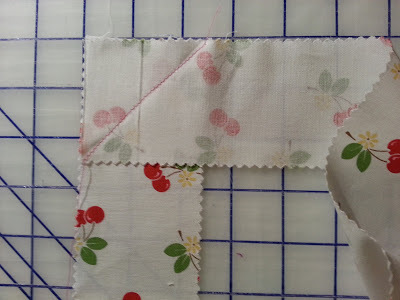 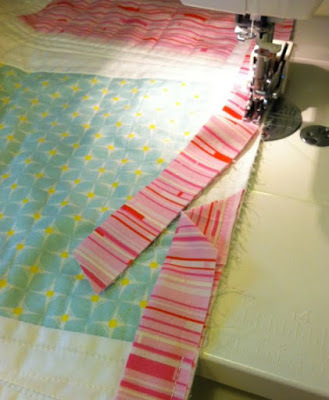 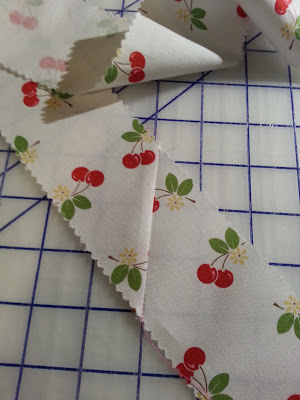 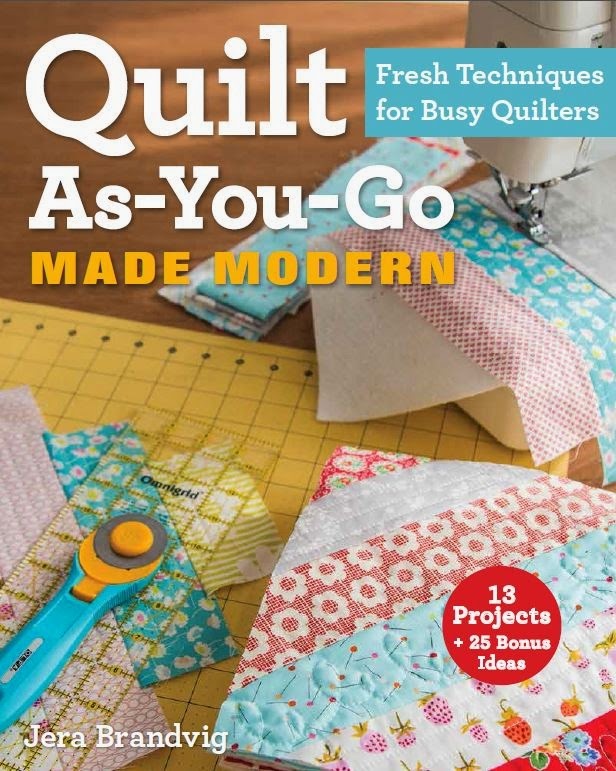 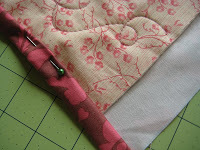 First, you need to prepare your binding strips and then sew them onto the back of your quilt using a 1/4″ seam allowance. 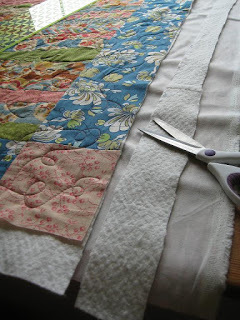 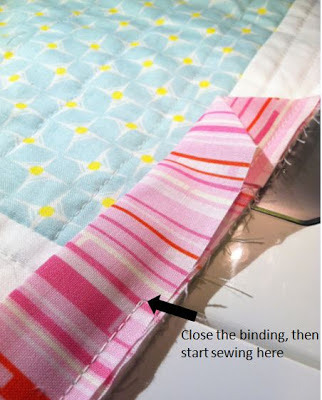 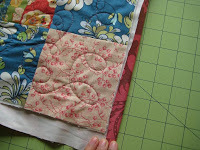 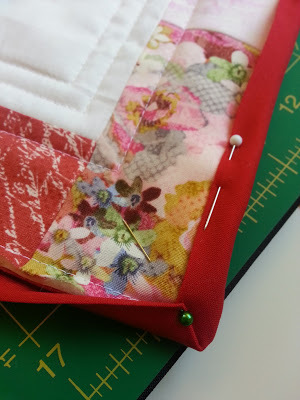 You can learn to do this by referring to Part I of my Binding tutorial, except as aforementioned, be sure to sew the binding strips onto the back of the quilt instead of the front. 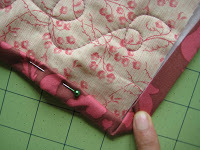 I suggest using an even feed walking foot when attaching binding. 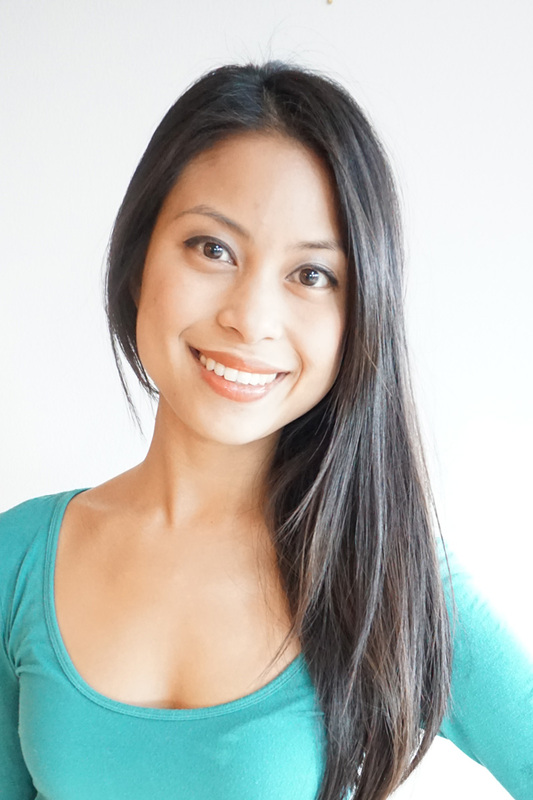 After you’re finished with Part I, return to this post to learn how to machine bind instead of blind stitching. 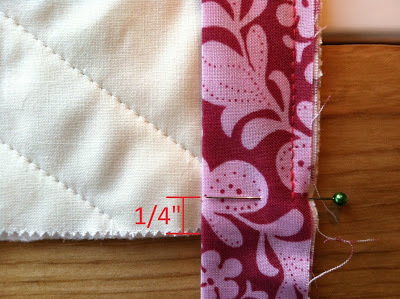 seam allowance as shown below. 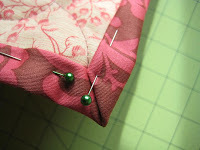 Iron the binding so that it lays flat and then pin to keep in place. 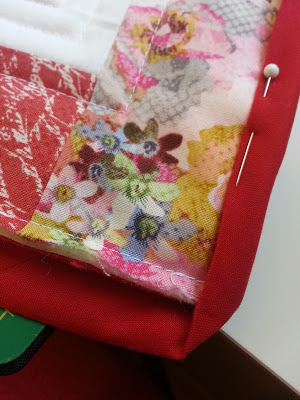 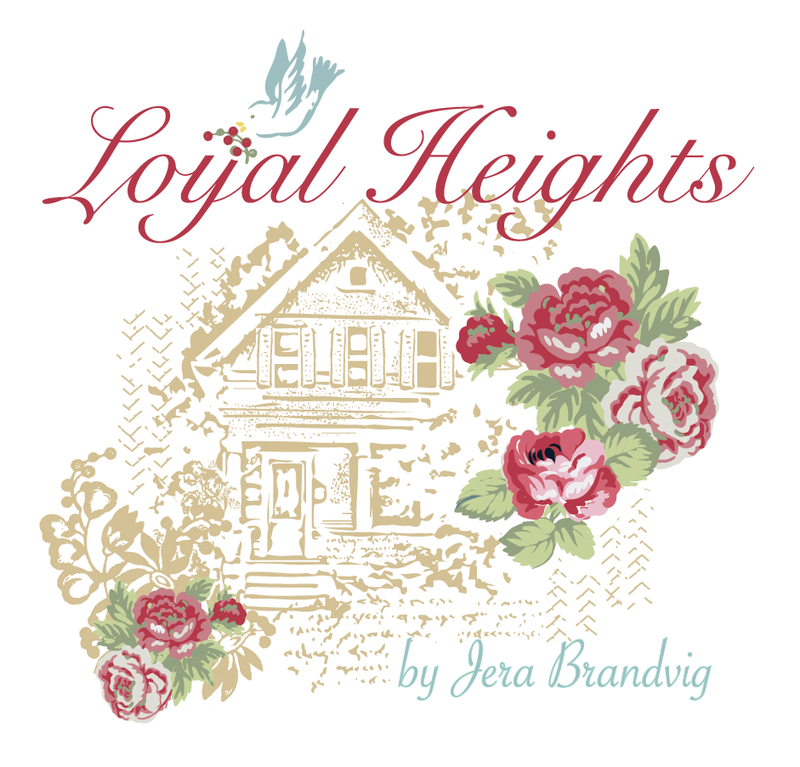 When you get to the corners, simply fold the bottom edge of the binding straight up, press flat with an iron and then pin the corners down to keep everything in place. 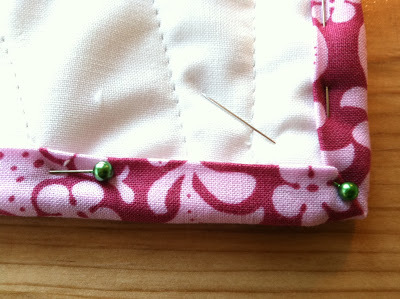 Be sure to place a pin on the corner (as shown with the green pin below) to lock down the corner folds. 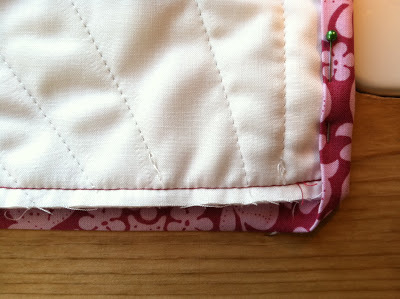 Lastly, sew a top stitch near the edge of your binding strip. 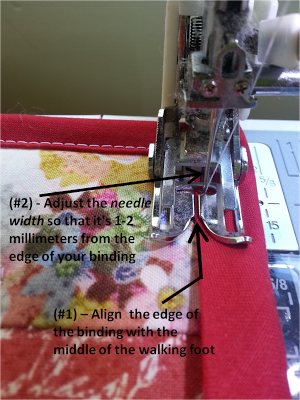 To achieve this, (#1) align the edge of the binding with the middle of your walking foot and then (#2) adjust the needle width so that it’s 1-2 millimeters from the edge of your binding (refer to the image below). Once you’ve adjusted the needle width, all you have to do is concentrate on guiding the edge of the binding strip along the middle of the walking foot. 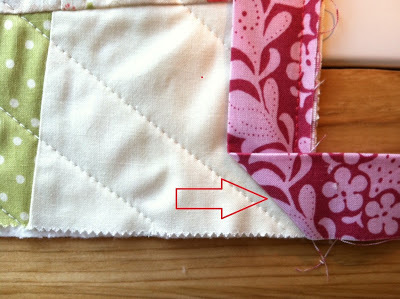 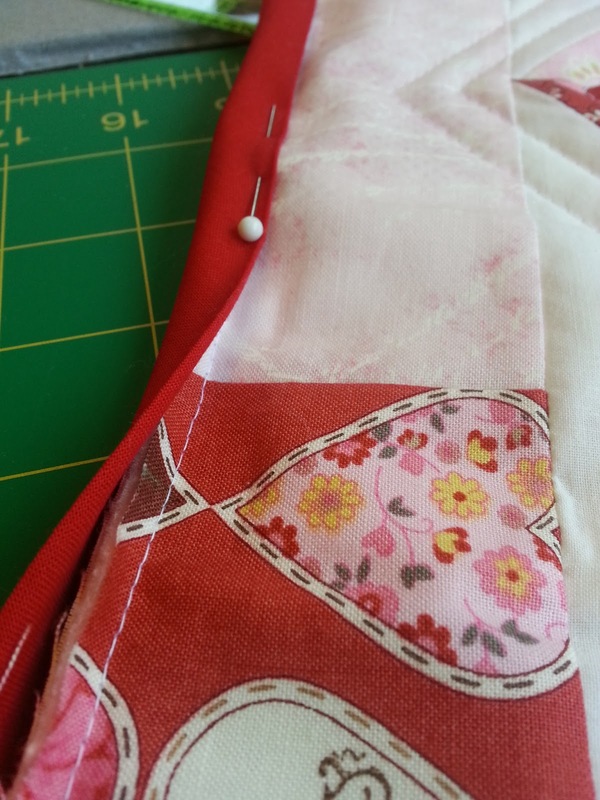 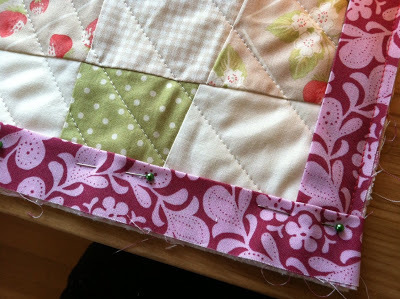 To stitch around the corners, slow down and remove the corner pin (the green pin) and replace it with the sewing machine’s needle to lock it down with a stitch. 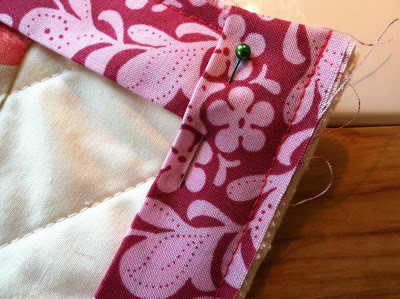 With the needle down in that corner, lift the walking foot and pivot your quilt 90 degrees, put the walking foot down, and then continue sewing your binding. 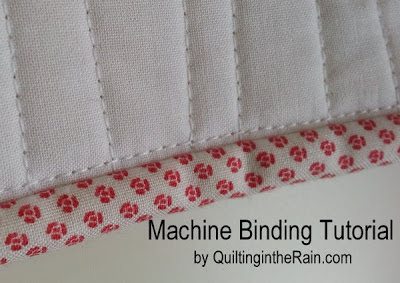 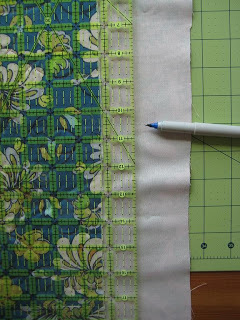 After you’re done machine binding, here’s how the front and back of your quilt binding will look.The top stitch will be on the front of your quilt, and on your quilt backing there will be a stitch that runs along the binding as shown below.